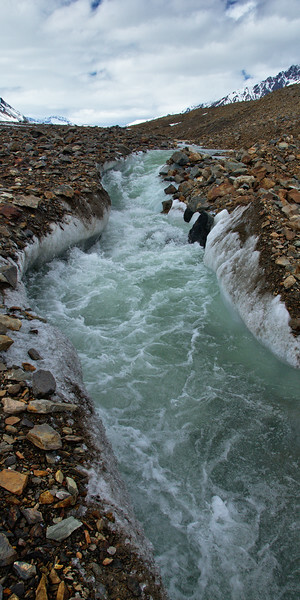 As stated in my profile (bio), I like supraglacial streams. It's a weird, child-like fascination. They are beautiful. 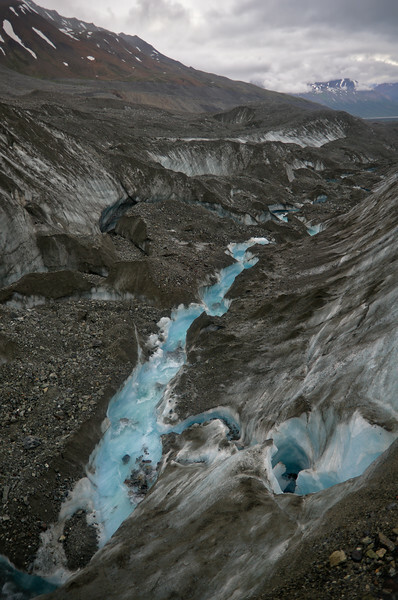 Often gorgeous blue when there's still snow around or when it's overcast, they form awesome canyons in ice, deposit little layers of dirt that refreeze and lock into the ice, and they are a total pain to get around or jump over when moulins haven't started draining them yet. Let me show you . 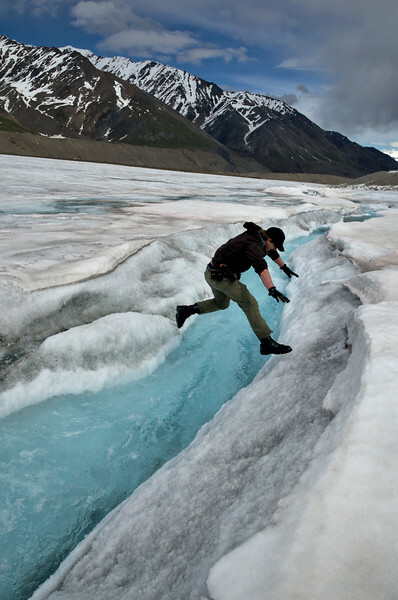 . .
That's Andrew, crossing one of about 5 or 6 fairly large streams we would have to cross to get from the medial moraine of the Black Rapids Glacier to the northern margin. I posted this to FB a while ago, and everyone had a little flip out, "er mer gerd, he curd dye!". I didn't really know how to respond. It's what we do. This stream was actually pretty low-key. If he fell in, he would be wet. Probably have a chilly walk back to camp to change. Then we'd go out again. When a stream becomes difficult to cross, or if the consequences of a mis-step in an easy crossing are disastrous we rope up, or better yet, wait for a better time to cross. We're actually incredibly cautious. We spent an entire day trying to navigate across this one. And had to wait a week before it was safe enough to cross this one. It was a problematic time for us. 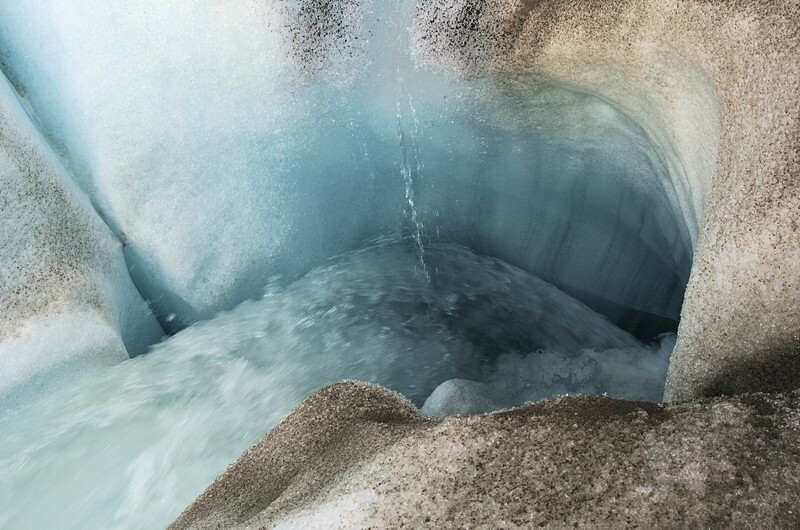 Usually moulins open up, conduits that carry water to the bottom of the glacier. Usually I'd just follow the water downstream to a moulin, then it's easy to just walk around. 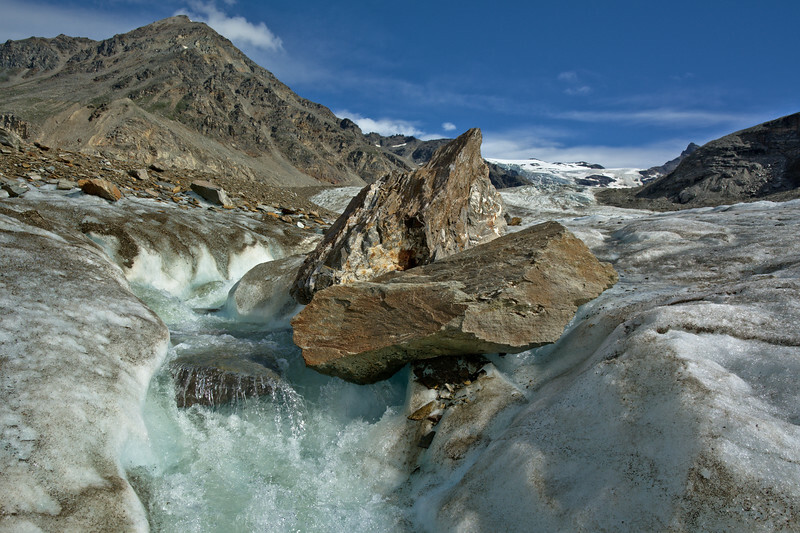 But, in order for this to happen, the subglacial hydration system needs to be ready, open to carry the water out. 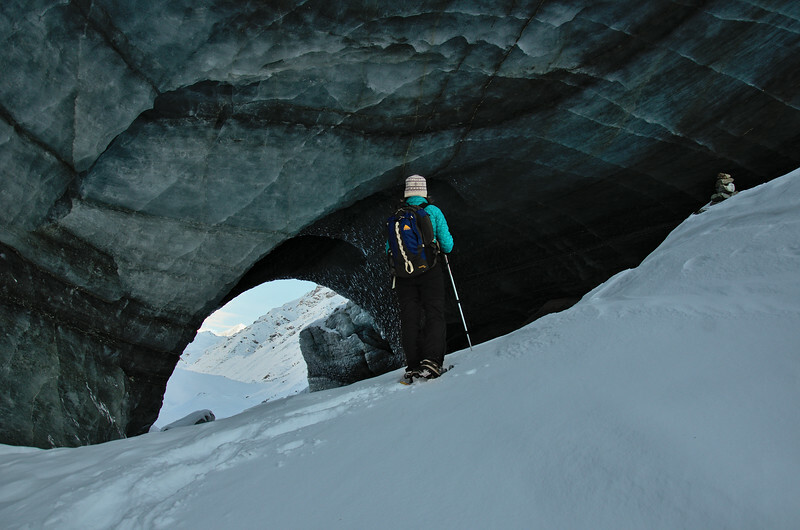 Over winter this shuts down, the glacier "re-sticks" to the earth beneath. It just wasn't ready yet. 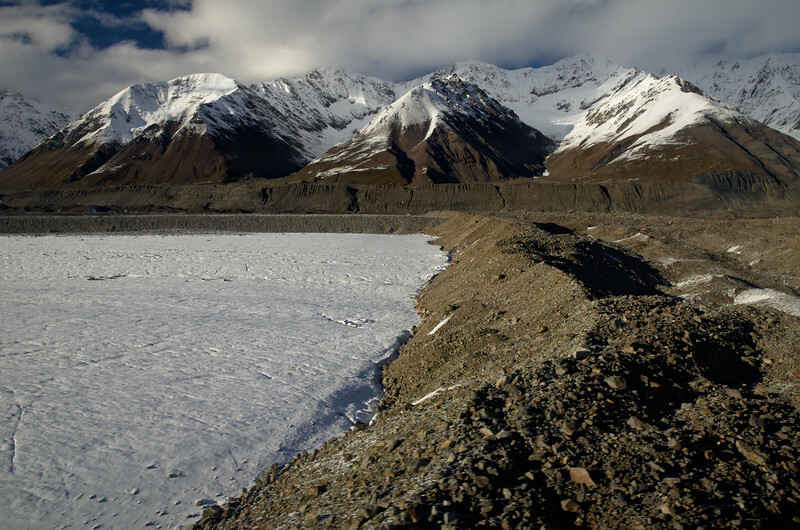 Since there was no water draining, it simply continued downglacier until it pooled against this landslide debris in the photo above. This is cool. In 2002 there was a 7.9 magnitude earthquake here. 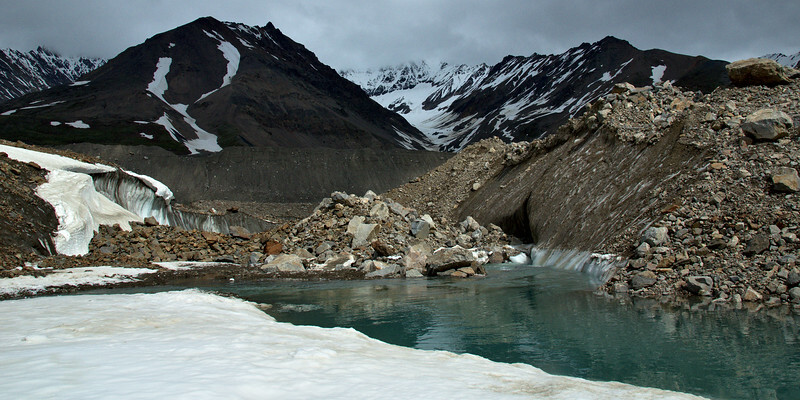 It caused enormous landslides, whole mountainsides collapsed, covering the entire width of the glacier. It's over 1.5 miles across and some of the slide had enough momentum to actually run up the other side of the valley a bit. Here's another view of that landslide debris from the air. The rocky talus is only a thin layer. The reason it looks so tall here is because the rock insulates the ice beneath it. The exposed ice melts much faster. The height difference is mostly the difference 12 years of melt between insulated and non-insulated ice. Neat! And totally off track. Back to water. And canyons! 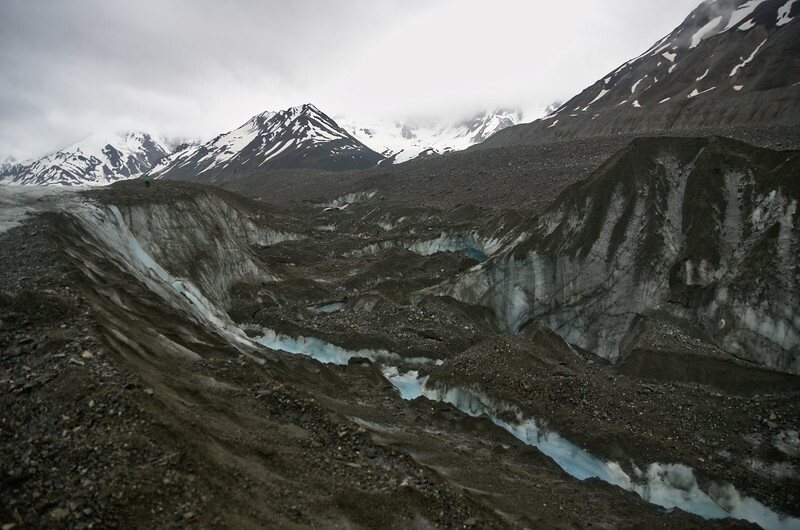 That's a water carved canyon on the edge of a lateral moraine on the Canwell Glacier (still Alaska Range). It was pretty deep in places, but this was taken on a cold day, late in summer, making it pretty easy to climb into and cross. Here's another photo of the same spot looking up-glacier. Find the tiny human being for scale. Even in the middle of winter there are signs of the huge effect water has. Like the ice cave below. This is what's left of one of those sub-glacial channels, formed in those summer months when it's completely full of water. On this day it was -20° F, so there wasn't much water flowing. But there was some overflow in the creek. Even in winter there's a bit of water from pressure melting and geothermal energy. This was on the Castner Glacier - Also in the Alaska Range. Spring and summer is when the real action happens. 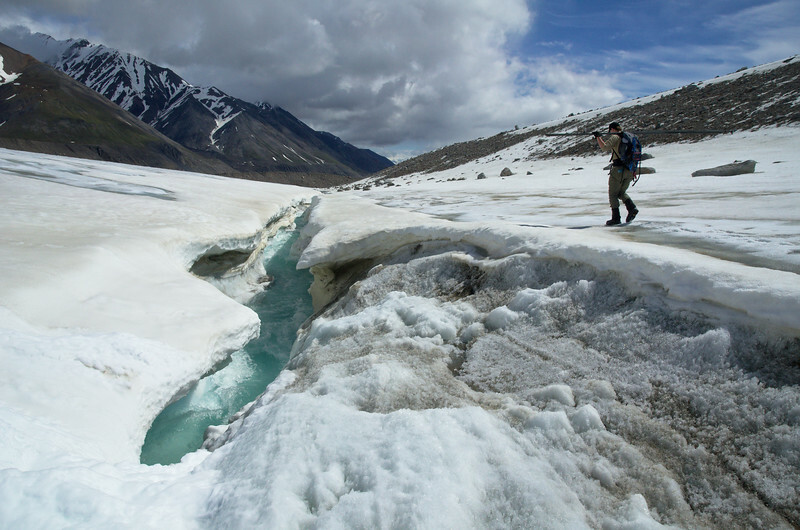 The snow slowly melts down to ice below the equilibrium line. Eventually the water-saturated snow starts to collect and slowly flow downstream. 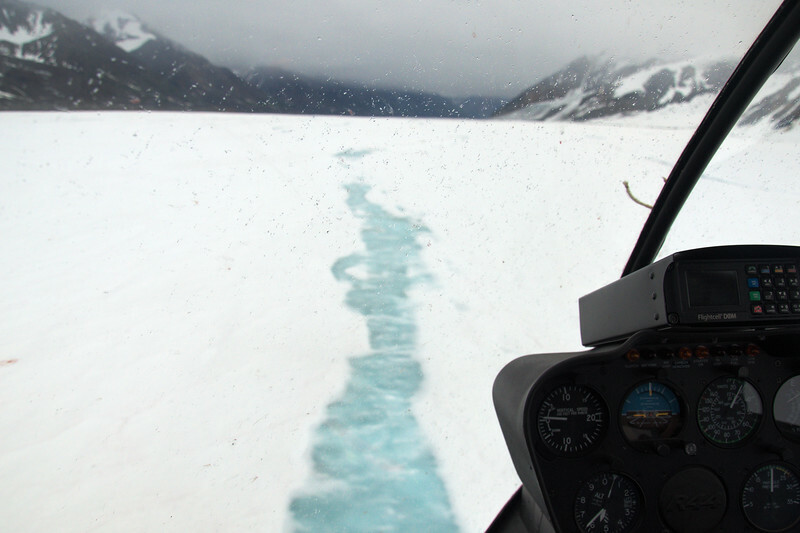 Giant, blue slush streaks form. That's not really what I'd call a stream yet. But, usually with a few days something like that, turns into this . . . There's not much that's more beautiful than these streams wandering through snow in my opinion. The color contrast is incredible. 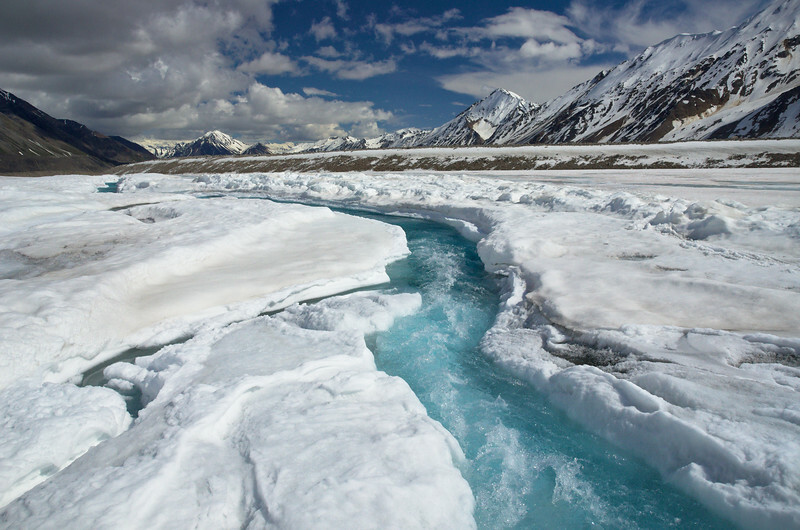 Once the snow is gone the streams often lose that "pop" since the ice isn't as reflective. I still like them, though. 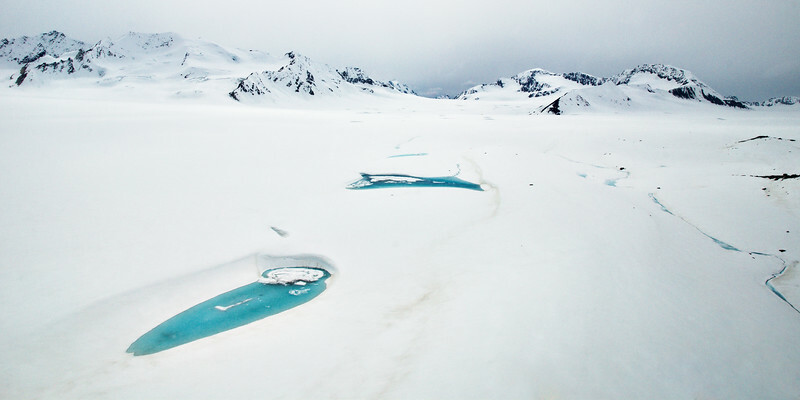 Sediment carried by the water is deposited in little holes in the ice. 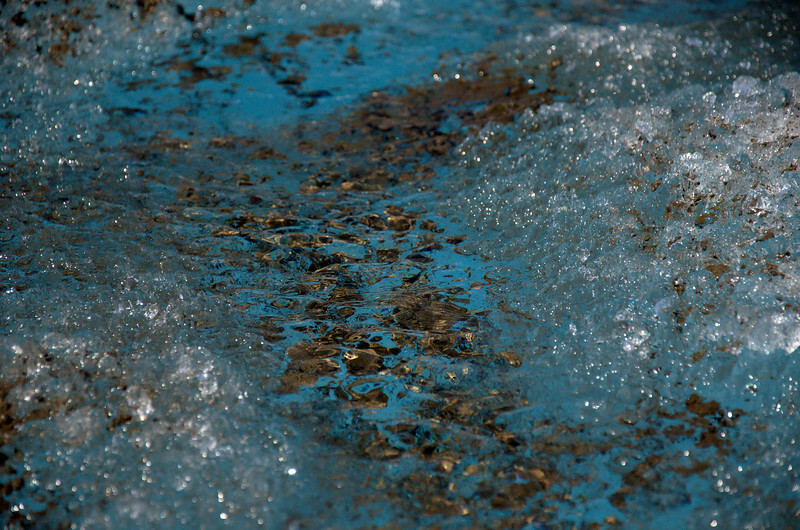 Sometimes the water refreezes and there are little spots of dirt locked and layered in blue ice. Then there are those conduits to the inside, moulins. 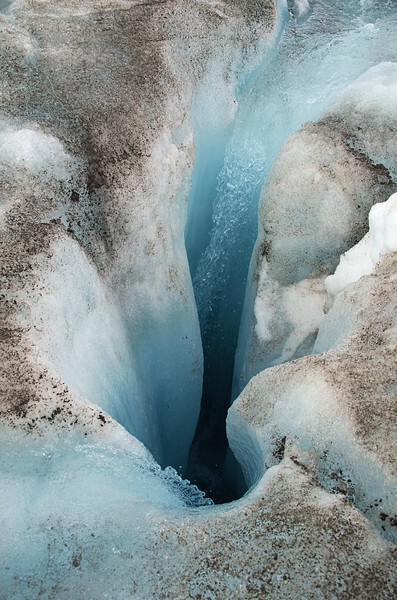 They often form where water flows into a crack or crevasse. 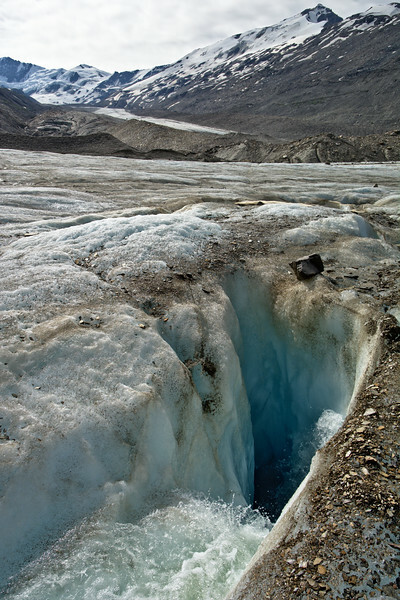 If there's enough water available, they grow larger and stay open even after the crevasse "heals". Moulins are fascinating, and terrifying. Their roar is incredible. The incredible dynamic between ice and water commands my attention. Moulins change size and shape daily, streams change course, start or stop with changing weather, pools and lakes form and drain rapidly, every year I visit some of the same places to find a completely different hydrology on the surface. Water on ice can be subtle, serene, powerful, sometimes violent and catastrophic, and captivatingly beautiful. I'll always head out on the ice to marvel in it.